It hit the headlines as Ground Zero of a catastrophe, but the Enrique Rebsamen school soon became a global focus of hope amid the devastation of last month's 7.1 magnitude earthquake. Breathless TV reports recounted the inspirational tale of Frida Sofia — the 12-year-old who had miraculously survived in the rubble following the collapse of a school wing that killed 19 fellow students and seven adults. Alas, the news of Frida Sofia turned out to be fake, the product of misinformation, confusion and a collective desire for an upbeat narrative from the ruins of the Sept. 19 disaster. Today, more than two weeks after the quake, the school has come to embody something else — the corruption, back-door deals and shoddy building practices that authorities suspect contributed to the collapse of dozens of structures and the deaths of at least 369 in the quake. The school, shuttered and cordoned off by police tape, is now enveloped in a toxic cloud of accusations and ill will. Mexican education authorities have revoked its operating license. And the school is not the only earthquake-pummeled building here attracting law enforcement attention. The Mexico City prosecutor's office says it has opened up almost 150 investigations related to the earthquake, including inquiries into the collapse of 38 buildings in the capital, among them the Rebsamen school. Future criminal charges could include homicide, fraud and negligence, officials say. Among the areas of inquiry will be whether building owners kept up with reinforcement of concrete support columns, other retrofits and assorted safety measures mandated after the 1985 earthquake, which killed thousands here. There is broad suspicion that many property owners failed to ensure their buildings were up to code, in some cases paying off inspectors to avoid doing the work. None of the cases of the downed buildings has been as incendiary as that of the Rebsamen school, with 400 students in a middle-class district in the capital's southern borough of Tlalpan. "This is an outrage," Claudia Sheinbaum, Tlalpan borough chief, told reporters in announcing a criminal complaint for negligence against the school's owner/director and two former borough officials. "It remains for prosecutors to determine it. But in our minds, yes, the word is corruption." Sheinbaum, considered a front-runner in next year's mayoral elections as a likely candidate of the left-wing Morena party, pointedly distanced her administration from any potential wrongdoing, although she has been in office since 2015. The two borough officials whom she cited worked for a previous administration. The borough chief cited a series of irregularities, including land-use violations and improper additions to the school. In 2014, she said, the school paid a fine of about $1,400 to avoid a possible shutdown for illegal construction at the site. Sheinbaum said investigators would determine whether illegal additions at the school contributed to the disastrous collapse. Mexico City prosecutors have summoned the school's director and owner, Monica Garcia Villegas, to appear before investigators. Garcia lived in a rooftop apartment on the school grounds and survived the collapse. She has not commented publicly on the matter. 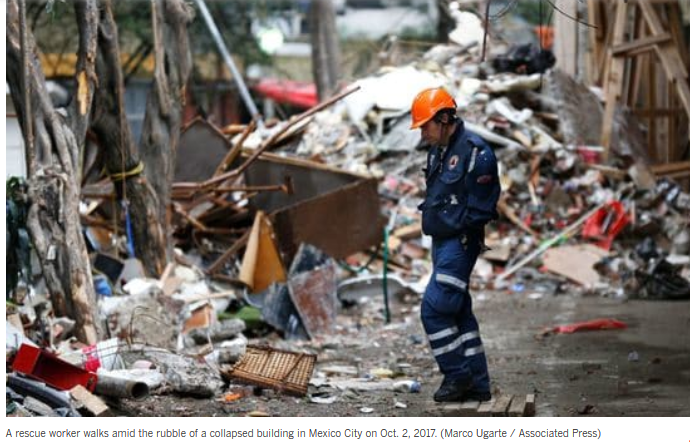 Also among the multiple earthquake incidents attracting police scrutiny are the casualties suffered at another school, the Mexico City campus of the prestigious Monterrey Institute of Technology and Higher Education. Five students were killed and dozens injured when structures collapsed or buckled on the sprawling campus of the exclusive private institution. Prosecutors are investigating whether construction or maintenance deficiencies contributed to the deaths. Authorities are also looking at possible "anomalies" in a doomed six-story office building at 286 Alvaro Obregon Ave. in the capital's Roma Sur district. The midday collapse turned the structure into a pancaked debris pile and a suffocating tomb, killing 30 men and 19 women. The death toll at the office building was the highest at any one venue in the earthquake. Only 28 people who had been inside the building when the earth started shaking survived, according to official accounts. Early Wednesday, rescuers pulled out the last body from the building on Alvaro Obregon. That signaled the end citywide of efforts to rescue survivors or recover corpses from the rubble. This time there would be no miracle survivors, pulled from the wreckage two weeks later. Mexico's acclaimed searchers, known as topos, or moles, were picking up their gear and leaving the scene. A heavy crane and bulldozers began clearing the mountain of debris, once a collection of offices, at Alvaro Obregon. A huge billboard with a stylized tooth advertising dental service hung on a wall next to the compressed mound of rubble where so many lives had ended. In the streets, a few of the posters seeking information on people believed missing in the office building still clung to trees and lampposts. Miles to the south, at the site of the Enrique Rebsamen school, a sense of tranquility prevails where once there was chaos. Only a few curious residents and the odd media crew stop by a cordoned-off square block that not long ago featured hordes of media and rows of satellite broadcast trucks. Interest in the earthquake-pummeled school evaporated as soon as the saga of Frida Sofia, the supposed 12-year-old trapped alive in the rubble, proved to be a sham. "The whole thing about Frida Sofia was made up, they played with the hopes of those poor parents," said Claudia Herrera, a neighborhood resident and mother of two who was among the curious taking a look at the collapsed school building on a recent afternoon. On the day of the quake, Herrera recalled, she ran to a neighboring school — just across the street from the Rebsamen building — to pick up her children, 15 and 18. Both were safe, and her children's school, like others in the vicinity, was not seriously damaged. "Now it turns out the whole situation was about money and corruption," said Herrera. "That's why the school collapsed and those children died. It's a disgrace."